This is pre-Bayh-Dole, of course, but also pre-revived IPA, and also pre-Kennedy patent policy. The patents issued in 1959 and 1961. The co-inventors’ work (one from the University of Wisconsin and one (apparently) from Hoffman-LaRoche) was funded by federal money, foundation money, and company money. WARF gets patent rights and licenses the patent exclusively to the company. The public money? That gets noticed as the royalty and diligence provisions in the exclusive license (as if, ahem, there would be no such royalty or diligence requirement otherwise). And what happened then? Look at it from the PHS perspective. PHS provides subvention funding to a researcher at a university, expecting results to be published and public benefit to come from everyone’s access to those results. A richer public domain, you might say. Instead, WARF gets patents and creates a monopoly, granting the right to exploit that monopoly to a company research partner. One argument (made by Phyllis Gardner, a BIO representative at a Congressional hearing in 2003) was that the federal government’s intervention to put the WARF patents on 5-FU into the public domain delayed the creation of commercial products. Another argument (not made by anyone that I know of) is that WARF patents on 5-FU restricted research on finding more effective and less toxic forms of cancer therapy by claiming by patent a wide range of compounds, of which 5-FU is just one. It may well be that it is expensive work to choose one of these many compounds and prepare it as a commercial product–but it is even more expensive if one has to do that work alone, without anyone else contributing insight and resources. Perhaps if one is a wealthy company, or has wealthy backers, it is desirable that the cost be sufficiently great that no one else would attempt development. Perhaps that is the effect of this use of patent monopolies–to ensure that the investment opportunities go only to those with access to sufficient wealth to pay for whatever work is needed to create a commercial product. If there are to be “high returns” from such “high risk” activity, then those returns should properly be directed to those who have sufficient wealth to command the opportunity in the first place. One does not have to go down the road toward stripping patent rights from all inventions made with public support to wonder whether patents in the hands of institutions results in creating a betting parlor for wealthy speculation–that betting parlor may well also create from time to time commercially valuable products, and even public benefit. The question is not whether such things happen but rather whether it’s good public policy to set things up so that such things happen preferentially, so the system is rigged, as it were, for this result. We might also ask whether such things happening once every 1,000 inventions is sufficiently often to throttle up a hundred thousand inventions with patents in the hope of lucrative returns from one hundred of them. So what happened with 5-FU? Of course, there was no “drug”–there were multiple–many, a plurality–of compounds claimed by the patents, along with processes to make them. And the compounds were not placed in the public domain–they were made available under the government’s patent rights. What was lost, “effectively,” was a monopoly held by the company that had done the synthesizing of a compound in support of the research at Wisconsin. Should some public money involved in the research prevent an researcher from obtaining a patent? Should that public money require the patent to be licensed non-exclusively (even if not royalty free)? Or, should that public money require the researcher to give up rights to the invention to the university, to be passed over to WARF, to be managed so that WARF and the university get a majority cut of whatever income they make from licensing the patent? 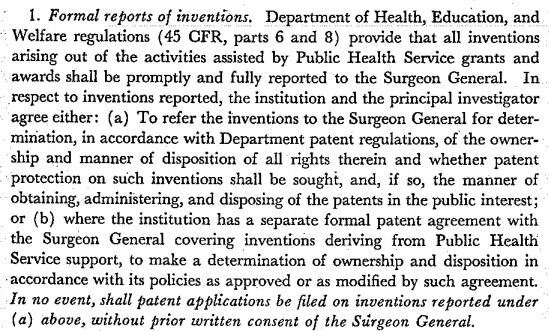 Under the Kennedy patent policy (1963), companies with commercial positions and capability were allowed to “retain principal rights” in inventions made with federal support. One would think, if things were being managed at the PHS consistent with the Kennedy patent policy in the mid-1960s, that Hoffman-LaRoche would be allowed to retain principal rights. But that’s not what happened. 1) the institution and principal investigator report the invention to the PHS, and the PHS decides what to do to “dispose of the patents in the public interest” (since, apparently, inventors cannot be allowed to use the patent system on their own, which in this line of reasoning would not on its own without public oversight be in the public interest–despite what the court in WARF antitrust case involving irradiated milk had to say. The PHS here aimed to prevent having to go to court to enforce its public policy specific to research to improve health care. Whatever the patent system might be good for in general, the PHS insisted that a public covenant should follow any invention made with federal support–antitrust law was not enough, not soon enough, and expensive to use. 2) if there’s an IPA (the IPA program started in the early 1950s, but only a few universities obtained an IPA before adding institutions was suspended), then the institution and principal investigator “make a determination of ownership and disposition in accordance with [the institution’s] policies”–including any modifications to policy required by the IPA. That is, the PHS patent policy is part of the funding agreement. Both the institution and principal investigator are parties to the funding agreement and have “joint responsibility” for compliance, including reporting inventions. The italicized portion represents the point of concern: the PHS wants to know of any invention that is grant supported or even grant related. That is, the claim is that inventions made regarding public health and related (“might possibly be construed in manner”) to PHS funding must be reported. The PHS language is reminiscent of the 1958 Space Act requirements on federally funded research involving space technology. (2) the person who made the invention was not employed or assigned to perform research, development, or exploration work, but the invention is nevertheless related to the contract, or to the work or duties he was employed or assigned to perform, and was made during working hours, or with a contribution from the Government of the sort referred to in clause (1), such invention shall be the exclusive property of the United States, and if such invention is patentable a patent therefor shall be issued to the United States upon application made by the Administrator, unless the Administrator waives all or any part of the rights of the United States to such invention in conformity with the provisions of subsection (f) of this section. That is, under the Space Act, if an invention was made under a federal contract, or with a contribution of resources from the federal government, or related to the contract and made during working hours, the government owns the invention unless the government waives its rights to own. The PHS policy suggests much the same thinking, but as a matter of federal contract rather than statute. Matters of public health are comparable to those of space exploration–if the federal government has contributed, then the disposition of patents rests with the federal government unless it has agreed otherwise. It does not matter if the invention was made in the performance of work or is just related to the performance of work; the disposition of any such invention is a matter to be decided by the federal government in the public interest–and not, then, in the private interest of any particular inventor, university, patent broker, or company. On the one hand, this requirement makes perfect sense. The federal government need not be in the business of supporting research to aid the public only to have everyone involved trying to clean up financially with patent monopolies and creating patent gridlock when they are not creating monopolies to gouge the public (and the federal government, if they can get away with it). On the other, the requirement appears over-reaching. It aims to do by policy what ought to be a matter of statute. If there are to be limitations on the patent system, so that inventions of a given sort should not be issued to the inventors, and the inventors are not free to manage their interest as they wish, then shouldn’t those limitations be expressed as statute and not simply as the demands of a federal agency? But consider this. The expansive scope of the federal interest results in more inventions supported by subvention funding being made available to everyone–including all companies in an industry. Given that an “invention” in the area of pharmaceuticals is almost always a class of compounds–hundreds to thousands of compounds may be claimed in a single patent–making an invention broadly available means making hundreds to thousands of compounds broadly available. That is, those compounds were already ”available” and the fact of “invention” should not alter that standing. Thus, a broad scope to the PHS’s claim equates to a broad scope for public access. Now consider what happens if an organization such as WARF co-opts the federal government’s broad scope of interest. We get an entirely different result. What was broadly claimed by the federal government to expand the public access becomes broadly claimed by a university patent broker to remove whole classes of compounds from research use, professional use, and industrial use and put these “inventions” behind university patent monopoly paywalls, awaiting speculative investors. Where the federal government might claim a broad scope and thus limit the opportunity for monopoly patent practices, we might expect the government to insist on a narrow scope for inventions that an institution might claim from publicly funded faculty inventors with the intent of assigning these inventions to corporations for monopoly exploitation. Here, our interest is not so much the merits of the public policy one way or another, but the effect of a shift of the beneficiary of that policy with regard to the scope of interest claimed first by the federal government and then, later, under the influence of the IPA program followed by Bayh-Dole, by university patent brokers looking to expand the inventions that they controlled. This entry was posted in Bayh-Dole, History, Policy, Sponsored Research and tagged 5-fluorouracil, 5-FU, antitrust, Bayh-Dole, IPA, WARF. Bookmark the permalink.